In two earlier posts, we saw that minuscules 138, 264, 1221 do not contain an asterisk at Mark 16:9 to convey scribal doubt about Mark 16:9-20, contrary to a claim spread by Daniel Wallace. Another manuscript which Wallace says has an asterisk accompanying Mark 16:9-20 is GA 2346. 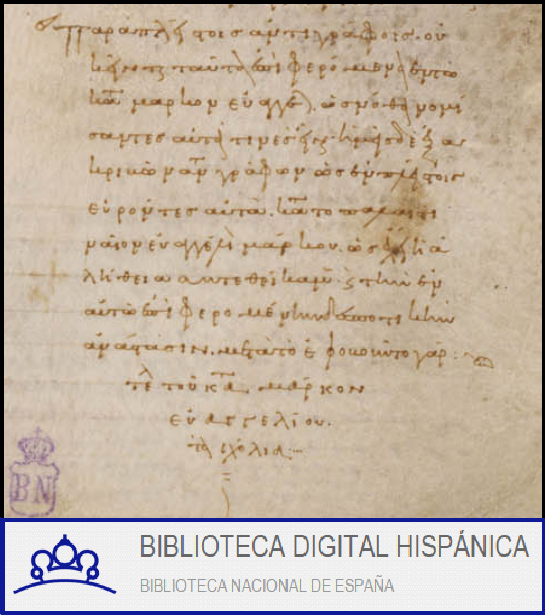 For some time, digital photographs of 2346 have been available to view at the website of the Center for the Study of New Testament Manuscripts. Mark 16:9 is on Image #376264.
the ninth line of Scripture-text. 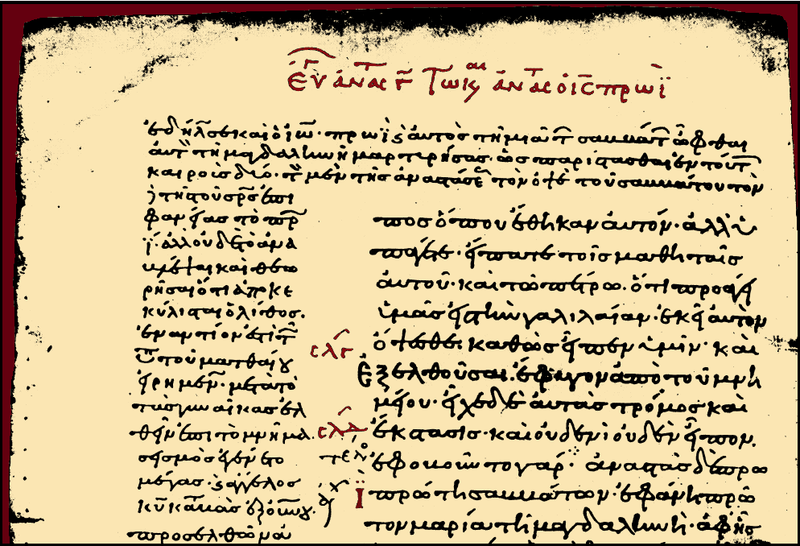 The lack of an asterisk accompanying Mark 16:9 in 2346, and the presence of ordinary lectionary-related features in 2346, are just as obvious when consulting the reproduction of the relevant page in 2346 in the 1918 volume The Gospel Manuscripts of the General Theological Seminary (reproduced here, digitally enhanced). 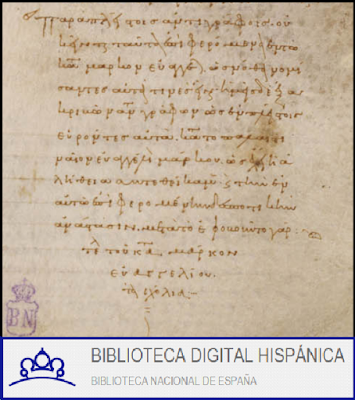 ● the first line of CSNTM Image 376511 – where a dot-lozenge accompanies the beginning of John 4:5, which is the beginning of chapter 5, the rubric of which appears at the top of the page, along with its incipit. The next manuscript which Wallace claims to have an asterisk accompanying Mark 16:9-20 is GA 2812. I described the relevant features of this manuscript in 2016, in the post Whatever Happened to the Zelada Gospels. As I pointed out at the time, the Gospels-text in 2812 is accompanied in the margins by the Catena in Marcum (attributed in this case to Peter of Laodicea instead of Victor of Antioch). A comet-symbol appears next to Mark 16:9, serving the same purpose as a footnote-number; in this case the symbol was intended to draw the reader’s attention to the note which accompanies the same symbol in the margin next to the end of Mark 16:20. (The comet-symbol also appears at the foot of the page, probably to help guide readers to the next page to find the note about the marked passage on the preceding page.) There we find the same part of the Catena in Marcum (already encountered in GA 138) that begins with Παρὰ πλείστοις ἀντιγράφοις οὐ κεῖται, and proceeds to advocate the inclusion of Mark 16:9-20, mentioning the presence of verses 9-20 in many accurate manuscripts, including the trustworthy Palestinian exemplar. ἀνάστασιν μετὰ τὸ ἐφοβοῦντο γάρ. Page-views of GA 137 can be viewed at the website of the Vatican Library. Unlike the page-views of GA 138, the photographs of GA 137 are in color. 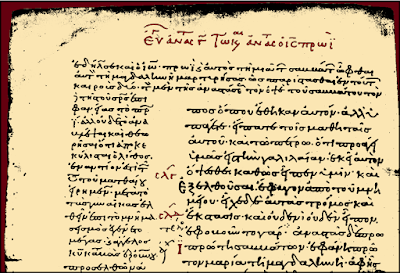 The text of Mark in GA 137 is accompanied by the Catena in Marcum; the identity of the commentary can easily be made by consulting the note at the beginning of Mark 16 and confirming that it begins with Μετὰ τὴν ἀνάστασιν ἤλθεν ὁ ἄγγελος, καὶ τὸν λίθον ᾗρεν διὰ τὰς γυναῖκας, and that is how the marginalia begins at the foot of the page on page-view 309. On page-view 310, Mark 16:9 begins in the seventeenth line of text – the same line in which Mark 16:8 ends. Between the end of verse 8 and the beginning of verse 9, written slightly above the text-line, there is a small red cross-symbol, resembling a “+” sign. It is hard to imagine how such an ordinary symbol could ever be confused with an asterisk. It serves the same purpose as a footnote-number, referring the reader to a note in the margin. The note (accompanied by another red “+”) appears at the foot of the page two pages later, on page-view 312. It is the same note – part of the Catena in Marcum – that we encountered in 138 and 2812, beginning with Παρὰ πλείστοις. Thus, out of the five manuscripts which Dan Wallace described as if they have an asterisk next to Mark 16:9-20 to convey scribal doubt about the passage – 138, 264, 1221, 2346, and 2812 – none of them really fit that description, and neither does 137. Minuscules 137, 138 and 2812 have a note about the passage (part of the Catena in Marcum) which supports the inclusion of the passage, and 263, 1221, and 2346 have ordinary marks – not asterisks – that are part of the lectionary-apparatus, and which recur elsewhere in the manuscripts. For David Parker’s statement see The Living Text of the Gospels, page 127, © David Parker 1997, published by Oxford University Press. "We have had too many cheap and hasty deductions from insignificant or insufficient data"
-- Hoskier, Concerning the Text of the Apocalypse, 1:xxxviii.